HÀ NỘI — Two Vietnamese players have been named in the best XI for the ASEAN Football Federation Suzuki Cup group round by Fox Sports. Striker Nguyễn Công Phượng was one of Việt Nam’s best performers. He scored the team’s first goal in a 3-0 win over Laos. 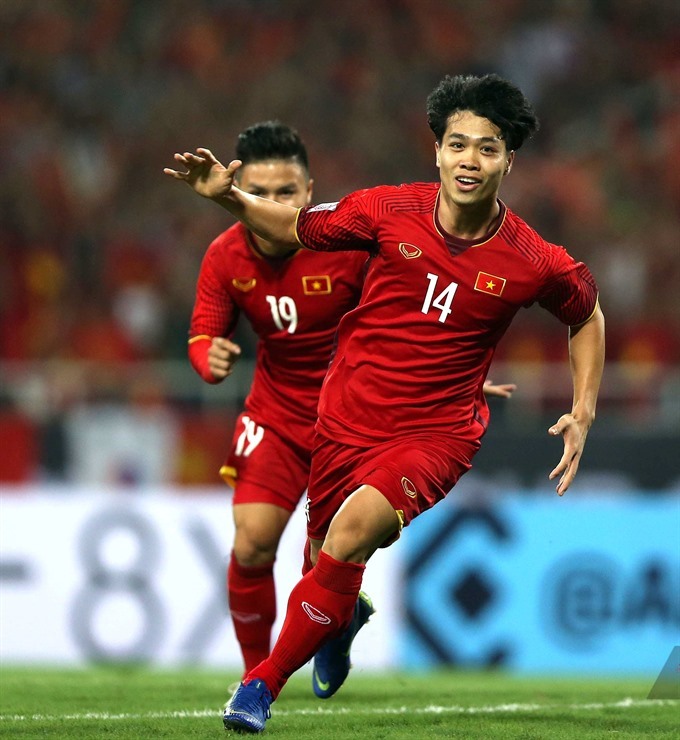 The 21-year-old Phượng added to his goal tally in their second match against Malaysia, which they won 2-0. Forward Nguyễn Anh Đức was also on the list as two of his three shots on target were converted into goals. His two assists during the four matches put him in the top eight assist providers. Other players on the list are Malaysian defender Syahmi Safari, Filipino midfielder Stephan Schrock and Thai goalkeeper Adisak Kraisorn. Singapore’s Hassan Sunny was named the best goalkeeper. Explaining why Sunny was chosen instead of Việt Nam’s Đặng Văn Lâm, who kept four clean sheets in four matches, Fox Sports said: "the Singapore custodian faced difficult oppositions in the form of Thailand, the Philippines and Indonesia, but still managed to keep one clean sheet. He even maintained a save percentage of 64.3 per cent, saving nine of the 14 shots faced." Talented midfielder Nguyễn Quang Hải was selected by many local newspapers, but did not make the best XI. He was picked as a substitute. However, Fox Sports did list him as one of the best passers in the competition. Hải stands second with 221 completed passes in the group stage. With 264 pass attempts in the competition, the midfielder made around 66 passes per game. He also scored two goals and had one assist. Việt Nam also contributed two of the top five most controversial moments. Nguyễn Văn Toàn scored for Việt Nam in the 77th minute against hosts Myanmar. But it was not recognised because of an offside violation. However, replays showed clearly the goal was legitimate. The game ended 0-0. The referee assistant’s decision cost Việt Nam a win to top Group A and advance to the semi-finals with one game to spare. Coach Park Hang-seo of Việt Nam also made headlines after the match as he refused to shake hands with Myanmar manager Antoine Hey after the final whistle. Explaining his reaction in a press briefing, Park said he knew Hey had posted something criticising him on a social network. Park saw Hey behaving unprofessionally during the match and told the German to review himself before giving advice to anyone.